Higher. Further. Faster. 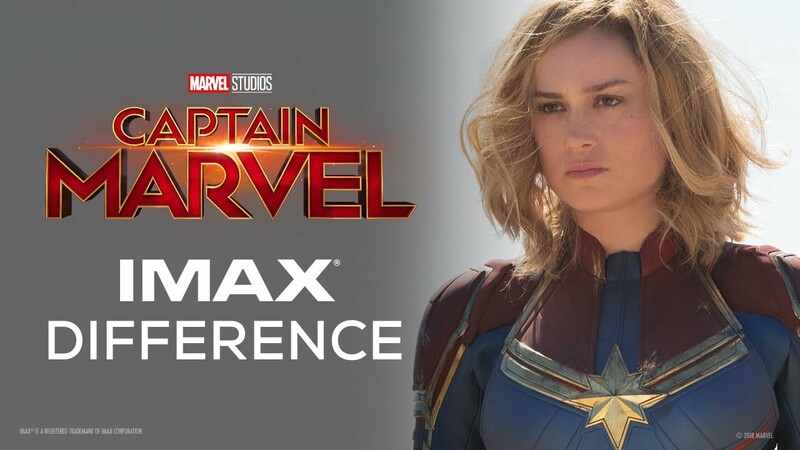 Experience up to 26% more picture, Captain Marvel only in IMAX theatres. Need more? 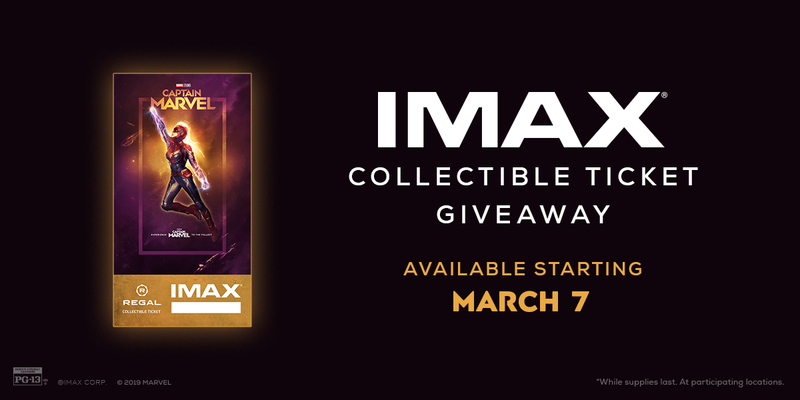 Take home these awesome giveaways when you visit select IMAX theatres on opening night! 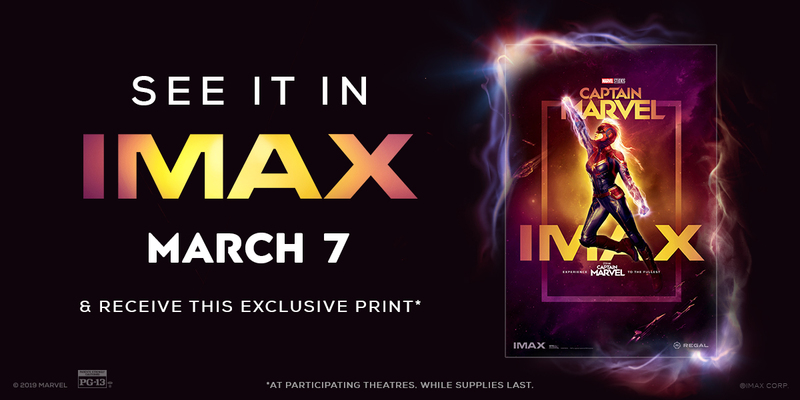 Fans who experience Captain Marvel in IMAX at Regal Cinemas on opening night (3/7), will receive an exclusive collectible ticket, while supplies last. Plus get a free promo code to redeem for a mini poster in the Crown Club Reward Center. Giveaways are available while supplies last and only at participating theatres. Full shipping rated apply for mini poster. Amstar Cinemas, Brenden Theatres, Celebration Cinema, Cinemagic, Cinema West Veranda LUXE Cinema, Cinemark Theatres, Cineplex, Cinémas Guzzo, Cinépolis Luxury Cinemas, CMX Cinemas, Frank Theatres, Fridley Palm's Theatres and IMAX, Galaxy Theatres, Goodrich Quality Theatres, Grand Theatre, Harkins Theatres, Landmark Cinemas Canada, Malco Theatres, Marcus Theatres, Megaplex Theatres, NCG Cinema, Penn Cinema, Premiere Cinema, RC Theatres, Reading Cinemas, Royal Cinemas, Santikos Palladium IMAX, Showcase Cinemas, Showplace Cinemas, Southeast Cinemas, The Grand Theatres, New Vision Theatres, TCL Chinese Theatre, Bullock Museum IMAX Theatre, Hackworth IMAX Dome Theatre at The Tech Museum, Esquire IMAX Theatre, IMAX Theatre at Tropicana, Maryland Science Center IMAX Theatre, Smithsonian Udvar-Hazy Center IMAX Theatre, Smithsonian Lockheed Martin IMAX TheaterAutoNation IMAX Theatre, IMAX Theatre At Marbles, Pacific Science Center IMAX Theatre, Challenger Learning Center IMAX, Branson IMAX Entertainment Complex, IMAX Theatre at Indiana State Museum, World Golf Hall of Fame IMAX Theatre, Natick Sunbrella IMAX Theater and Reading Sunbrella IMAX Theater.